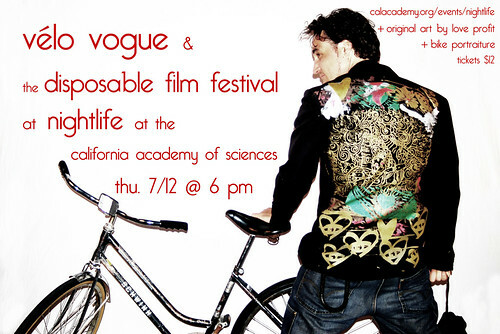 For the fourth year, Vélo Vogue joins forces with the Disposable Film Festival for their annual screening of the Best of Fest. 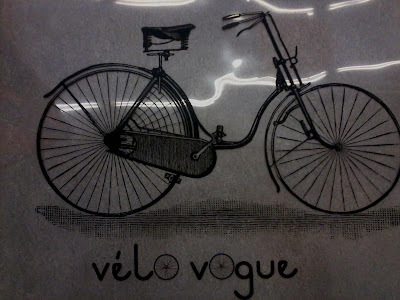 As usual, Vélo Vogue will host a bike portrait photo booth. So come and strike a pose with your bike for your 15 minutes of fame on Vélo Vogue. But this time, you can pose in front of a ONE OF A KIND backdrop painted and silk-screened by textile designer, artist and fashion photographer Daniel Chimowitz (formerly known as Love Profit), seen above posing for Vélo Vogue on that fateful night at the DFF when we met for the first time (and it's been trouble ever since). Here's a sneak preview of the backdrop that Daniel Chimowitz is designing. So come on out THIS THURSDAY EVENING to this very special DFF event hosted by the California Academy of Sciences at Nightlife. Details below. Thurs. 7/12 at 6 pm at California Academy of Sciences. Tix to the DFF/Nightlife $12.